Snow-Way Snow Plow Trip and Torsion Springs: Jack's is your Place! We have the Trip and Torsion Springs you need, with fast shipping and great prices! 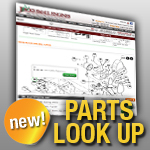 For snow plow parts and accessories, think Jack's! Size 18" X 3" X 3"